Kyrenia or Girne(this is the name you will find on the road-signs in the north) is a small city situated 26 kms to the north of Nicosia along the coast. It is a protected city, as in, you have the huge kyrenia mountain range just to the south of Kyrenia blocking it from the rest of Cyprus. This, in a way, makes the weather in kyrenia act different as compared to Nicosia just to the south of it. 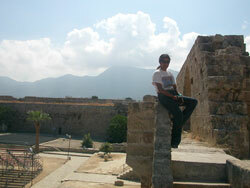 Kyrenia is pleasant year-round and even in such a small city, you have lot of places to keep you busy. 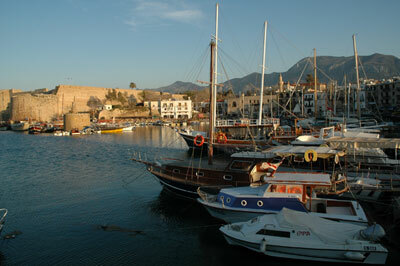 The place everyone goes first is the kyrenia harbour. This is the “downtown” of the city too. Narrow paved streets, lots of small shops selling trinkets and of course, dozens of eateries, this place is very lively throughout the day. The harbour is a U-Shaped with restaurants lining the entire stretch. The best place to park your car is the big parking place to the right of the last roundabout (travelling from nicosia) before the harbour (you cannot go on beyond this). The mountains in the backdrop make the harbour very photogenic especially when the weather is chilly with mist hanging around. 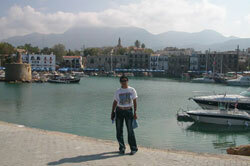 Kyrenia is the best place in North Cyprus to spend the night. 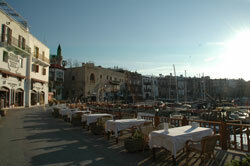 All other cities can be easily accessed from Kyrenia and Kyrenia’s nightlife is also quite popular. There are not many places around the harbour, as it mainly a shopping area. There is one place in the street next to the west end of the harbour. It is opposite a casino. But this place is good only if you just need a place for a few hours rest and nothing else. 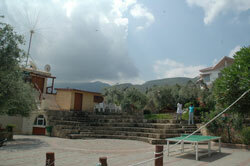 If you are looking for a good place to stay (with your family), i would recommend Pitoresk Holiday Village. 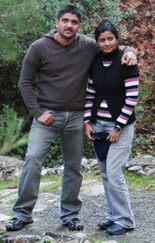 We found this place on our recent visit and it was awesome. Its location is good, away from the tourist crowd, yet close (few minutes drive) from the harbours and also to one of the biggest casinos (Jasmine court). At the first roundabout on entering kyrenia, take left (first exit), then at the first roundabout , take left (first exit) and then just after a bazaar on the right, take left and keep going towards the mountains. After around a km, you should see this on the left. At the west end of the harbour, there is a tourist information counter, where you can get a map and also driving directions to all the places you want to visit. Kyrenia is famous for its beaches (particularly to the west of Kyrenia towards morphou bay), but i havent been to any and hence can’t comment about them. Below are some of the places i have been to. 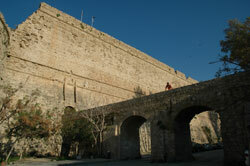 This castle is situated right next to the harbour. 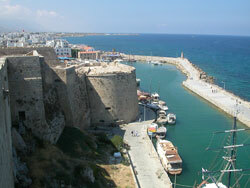 Just before the harbour, you have a small bridge which serves as the entrance to the castle. This is a pretty big castle with many chambers and with good views out to the sea. There is also a cafe inside, which might be needed if you are visiting this castle in summer! You can get good views of the caslte from outside too. Walk to the end of the u-shaped harbour, turn right and then walk until the very end. You will be in front of the castle with the mountains in the background. There is the shipwreck museum also inside the castle which is supposed to have the oldest ever preserved shipwreck inside (somewhere from 200 BC). 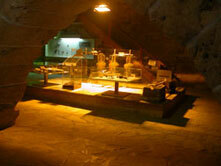 It is a very small museum , but good enough to take notice of. When i visited the castle, there were extensive renovations in progress. Maybe, they are all completed now and the castle looks even better!